Nitty Gritty Science presents guest blogger Carla Brooks from Science Island, who is not only one of the greatest science educators I’ve met, but has come to be one of my most treasured friends. Read along as this National Board Certified Teacher shares one of her tried-and-true authentic learning lessons on inheritance with, dare I say it…puppies! Aloha, Erica! Thanks so much for inviting me to write on your Nitty Gritty Science Blog. I’m going to start my own Blog one of these days, but in the meantime I’ll practice on yours. Today, I want to tell you about my all-time favorite Biology project! In the fall of 2003, I attended a workshop led by Grant Wiggins and Jay McTighe of “Understanding by Design”. The workshop focused on writing authentic assessments such as real-world projects to drive instruction and facilitate deeper student understanding. 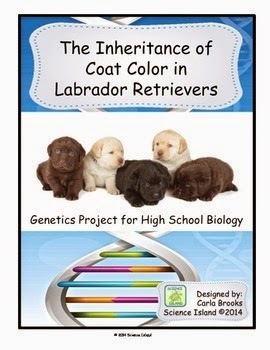 Over the next few weeks, I wrote four UbD projects that were used as exemplars for science teachers in the State of Hawaii, but my favorite project, by far, was my Genetics Performance Task “The Inheritance of Coat Color in Labrador Retrievers”. At the time I wrote this project, my German Shepherd puppy had just started AKC obedience training classes. One night, while I was cruising around on the Internet, I came across an AKC page that mentioned coat colors in the Labrador Retriever and the disqualification of the “Dudley”. While a perfectly wonderful pet, a Dudley is a yellow Labrador with chocolate (brown) nose, lips and eye rims instead of the accepted black. I read a bit more and learned about the inheritance pattern that determines the three coat colors in Labs. The next few days were spent working out a performance task with a real-world scenario for my students. 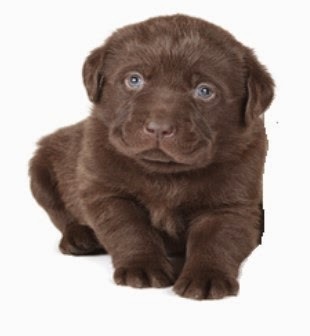 The project asks students to assume the role of a genetic counselor for dog breeders who are currently breeding black Labrador Retrievers, but now want to expand into breeding chocolate labs. The students are provided with information about six dogs, 3 male and 3 female, the genotypes of their parents and records from past litters. They have to apply what they know about patterns of inheritance, Punnett Squares, and the Law of Independent Assortment in order to develop a recommendation for the breeders. In addition, students learn about epistasis, a more advanced genetics concept usually not introduced until AP Biology. Over the next 10 years, I watched students work on this project with a mix of enthusiasm and frustration. But, it became obvious that they were enjoying this new challenge and, more importantly, they were determined to figure it out. A teacher’s dream! I have never had so many students stop by my room during recess or stay after school to ask questions and work on their project. They spent hours looking for pictures of Labrador Retrievers and puppies, drawing Punnett Squares, and trying to interpret them. I even had teachers from other departments stopping me in the office to discuss the project they had heard about from their students. Click image to check out this product! In the December 23, 2009 edition of Education.com researchers Christopher Harris and Ronald Marx state that “Authentic tasks are not the norm in schools and classrooms, but research and contemporary perspectives on how students learn suggest that these types of tasks are powerfully effective for learning.”1 I believe my Genetics Project, “The Inheritance of Coat Color in Labrador Retrievers”, is an authentic task with proven effectiveness in deepening student understanding. The combination of a real-world scenario, one of America’s favorite dog breeds, and the challenging, but achievable goal of the project all added up to great success. I looked forward to this project every year and I’d love to share it with you. You can find it in my store by clicking the image above.